Note: Below is an edited, shorter version of a letter available at http://web.mit.edu/history/Open%20Letter%20to%20Chinese%20Students%20at%20MIT.pdf. Recently, a group of Chinese students at MIT have protested pictures of the Sino-Japanese war which were posted on the MIT web site as part of the research project “Visualizing Cultures” conducted by Professors John Dower and Shigeru Miyagawa. The protest has included critical e-mail messages addressed to Prof. Miyagawa, group discussion with the faculty and members of the MIT administration, and a list of demands passed out at a meeting on April 26. Even though the protests are so far only verbal, they include extremely abusive messages directed at distinguished scholars of the Institute and demands for the suppression of free academic research. I am writing to you collectively in response to these activities. I address my remarks primarily to the graduate students from the People’s Republic of China who have initiated these protests. I hasten to add that I am sure that not all the Chinese students at MIT approve of these activities, but I hope you will pay close attention to their implications. You are some of the best and brightest young people of China, who have come to MIT in order to pursue education mainly in scientific and technological subjects with the leading researchers in the world. Many of you, I am sure, plan to return to China to use the skills you learn here to help China become a truly modern country. I respect your dedication to your studies and your deep concern for the honor of your country. I have spent twenty-five years at MIT teaching East Asian history to Chinese and American students, trying to engage them in critical discussion of the complex relationships between China, Japan, and the world from the sixteenth to twentieth centuries. I have dedicated my professional life to improving mutual understanding of what are often very painful subjects on which people hold passionate views. But even the most painful events deserve reasoned, careful, and open discussion if we are to prevent future tragedies. Therefore, I am deeply disturbed by these recent protests, because they threaten to destroy possibilities for productive dialogue. Although some of you may find my views difficult to accept, I must present them honestly and directly. I will add that I write only for myself and do not claim to represent the opinions of Profs. Dower and Miyagawa or the MIT administration. The images posted on the “Visualizing Cultures” Web site were not put there in order to offend. They are an integral part of an ongoing research and educational project which includes lengthy textual explanations that accompany each picture. John and Shigeru have put many hours of their time over the past two years into making the meaning of these materials as clear as possible. They have very graciously expressed regret over the misinterpretation of this image, but they did nothing wrong in the first place. This is not a case of unintentional insensitivity, but of deliberate misrepresentation. In historical interpretation, context is everything. Some students ripped one picture alone out of hundreds of pictures and accompanying textual explanation and broadcast it on the internet. This highly irresponsible act is what caused the uproar in the first place. Those who perpetrated this act have not expressed any remorse for the pain they have caused, nor do they seem to recognize the implications of their acts. John Dower explains very clearly that this is a racist, shocking image, that it mirrors Western racism against all Asians, and that it sowed the “poisonous seed” which led to the atrocious Japanese war in China. Anyone who read these words could not possibly mistake the image for an endorsement of Japanese imperialism. Therefore I conclude that those who broadcast the image without its context had malicious motives. They intended to whip up anti-Japanese hatred in order to promote a political agenda. Since John Dower has been the most sensitive of all scholars of Asia to the pain of racism, the fact that they took his work as the tool of their project is especially despicable. There is no excuse for it. Some of the students presented demands presented at the meeting on April 26 which are simply unacceptable by the ordinary standards of American academic life. They include: removing the website on Visualizing Cultures, apologizing to the Chinese community, canceling academic workshops scheduled as part of this research project, and revising the text and images to accord with the preferences of the students. 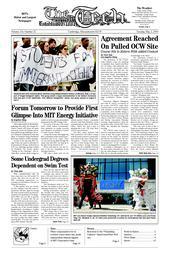 E-mail messages from some MIT alumni have even called for Professors Dower and Miyagawa to be fired. In order to calm the situation, the MIT administration and Professors Dower and Shigeru have conceded some of these demands, while insisting on their own integrity. I respect their decision, but let me explain why, even though I understand your anger, I find these demands unacceptable. MIT hires to its faculty only scholars of the highest caliber. When I was the head of the History Faculty, we hired John Dower after a national search indicated that he was the most outstanding scholar of Japanese history in the country. He has won many prizes to confirm that judgment. No one I know is more deeply committed to the empathetic understanding of the peoples of Asia than John Dower. Professor Miyagawa deserves equal respect. Contrary to the accusations of the protesters, the materials on “Visualizing Cultures” do not glorify Japanese imperialism. The visual images and the textual explanation describe and analyze the power of Japanese propaganda about the war. But to describe is not to condone. The text by John Dower makes it very clear that these images are shocking, racist, and sadistic. They did, however, have a powerful impact on the Japanese public at the time. We cannot ignore their power, but we must explain it. Suppression will not help us to understand them. You have a great responsibility as leading participants in China’s future. China faces huge challenges in its effort to become a wealthy, strong, democratic, and open nation. You should study not only technical subjects but also the crucial questions of social and historical change that will determine China’s future. There are many outstanding faculty at MIT and other universities who will gladly support your goals. Please open your minds to critical awareness of these most difficult questions in a spirit of reasoned, open intellectual discourse, not one of narrow, self-centered indignation. Perdue is the T.T. and Wei Fong Chao Professor of Asian Civilizations and Professor of History at MIT.